In diabetic patients, the body does not use and store sugar properly. High blood sugar levels cause damage to blood vessels and nerves. 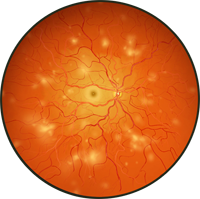 Damage to blood vessels in the retina is called diabetic retinopathy. In cases of diabetic retinopathy, the capillaries in the eyes contract, restricting the blood flow to the eyes, decreasing nutrients and oxygen. This causes a degeneration of the cells in the retina, thereby decreasing vision. When the retina no longer has enough blood supply to function properly, the eye forms new, fragile blood vessels in an effort to get enough blood to the retina. These new vessels tend to break and bleed into the “vitreous”; the clear jelly-like substance that fills the center of the eye. Vitreous hemorrhage can be mild, producing a few dark floaters, or it can be severe, causing a total loss of vision. When the blood vessels in the retina are damaged, they leak fluid or blood. The fluid and blood deposits in the retina, causing it to swell. If the swelling takes place in the center of the retina, vision becomes blurry or distorted. This is called “macular edema”. Vision loss from diabetic retinopathy is largely preventable. You can significantly lower your risk by maintaining strict control of your blood sugar, and having regular eye exams. MicroAcupuncture treatments help by increasing the blood circulation to the retina and eyes. When you suffer from diabetic retinopathy, there are some things you as a diabetic retinopathy patient can do yourself to slow down the progression of the disease. When you combine positive lifestyle changes and provide your body with necessary vitamins and minerals, you will "see" the difference. 4. Make it a habit to exercise at least 30 minutes every day, drink at least 64 ounces of water a day, and try to be lean with the salt throughout your meals. Diabetic retinopathy starts with plaque buildup in the arteries, so protect your eyes the same way you would protect your heart. 5. To monitor the development of diabetic retinopathy, you can get vision field scans, this will map the area and severity of the damage you have. You can have an amsler grid test to check for changes within the eye. You can also have a near visual acuity card test to check your vision in reading distance (18”) on a regular basis. You still have to keep up with your regular appointments with your ophthalmologist. For more detailed information about the nutrition for diabetic retinopathy, see our Diabetic Retinopathy Nutrition Page. Result from treating Diabetic Retinopathy with Micro Acupuncture.